XModem serial upgrades are supported by all Tibbo devices. Such upgrades can be used to upload new TiOS firmware and, optionally, a Tibbo BASIC/C application. oYou may upload just a TiOS firmware file (.BIN). All TiOS firmware is published here: http://tibbo.com/support/downloads/tios.html. oYou You may upload a TiOS firmware file combined with a compiled application binary. You can produce such combined files using our online tool found at http://apps.tibbo.com/bin_merger/ or using our legacy BinMerger utility (http://tibbo.com/support/downloads/tide.html). •Your PC must have a COM (serial) port. Built-in COM ports are now a rarity. Fortunately, there are inexpensive USB-to-serial adapters. Get one of those. •You will need a "terminal" software supporting XModem file transfers. We recommend our Device Explorer (DE) utility. You can install just the Explorer, or Tibbo IDE software (TIDE), which installs the Explorer along with it. Get the software here: http://tibbo.com/support/downloads/tide.html. •You will need access to your Tibbo device's serial port (UART). If your Tibbo device has a single serial port (UART), then this is the port you will be using. If your device has several serial ports, then you will need to use the first port. •Optional: you will benefit from being able to observe the patterns "played" by Green and Red status LEDs of your Tibbo device. •TPS devices — TPP2, TPP3, TPP2(G2), TPP3(G2). •Programmable serial controllers — DS1100, DS1101, DS1102, DS1202, DS1206. •Programmable boards and modules — EM500, EM1000, EM1001, EM1202, EM1206, EM2000, EM2001. •There is no need to select any device in the list. Click Upgrade... and choose Load Firmware Through the Serial Port (X-Modem). •You will be prompted to select the firmware file. •After you've selected the file to be uploaded you will be asked to pick the COM port. 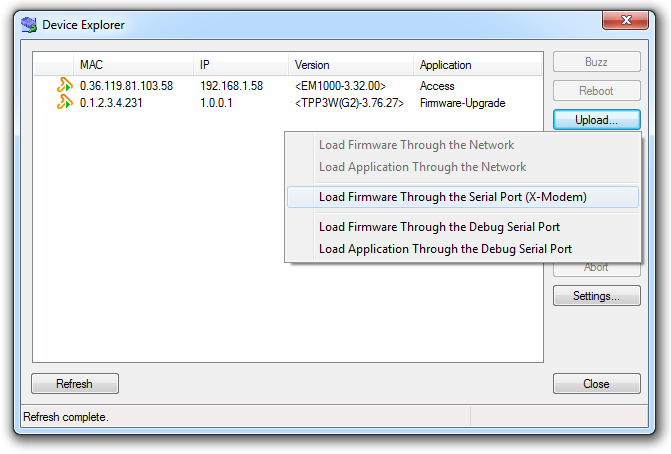 Choose the COM port you are using to perform the upgrade, then click OK.
•The Serial Upload dialog will appear. The message inside will read Power up you device with the MD (setup) button pressed. •Turn your device off if it was on. Press and hold the MD button (or pull the MD line LOW) and apply power to your device. Release the button (line) — this should start the upload. Green status LED will be on and flicker during the file upload. •After the upload completes, the Green status LED will be blinking slowly. Reboot (power-cycle) your device to boot into TiOS. •XModem serial updates rely on the XModem protocol. With the protocol, it is the receiving side (programmable Tibbo device) that sends the first character in the exchange. This character is ASCII SOH, and it means that the receiving end is ready to receive the file. In response to the SOH character sent by the receiving side, transmitting side (your PC) commences the file transfer. To ensure successful file transmission, always start the file transfer on the PC end first, then power your Tibbo device up with the MD button pressed. oIf the Ethernet mode is supported, the M/L will proceed into this mode. oIf the Ethernet mode is not supported but the BLE mode is supported, the M/L will proceed into the BLE mode. oIf neither Ethernet, nor BLE mode is supported, the M/L will halt with a "timeout error" pattern (Red Status LED blinking slowly).